For 2017, that means you’ll each pay the maximum 15.3% SE tax rate on the first $127,200 of your respective shares of net SE income from the business. Those bills can mount up if your business is profitable. To illustrate: Suppose your business generates $250,000 of net SE income in 2017. Each of you will owe $19,125 ($125,000 × 15.3%), for a combined total of $38,250. 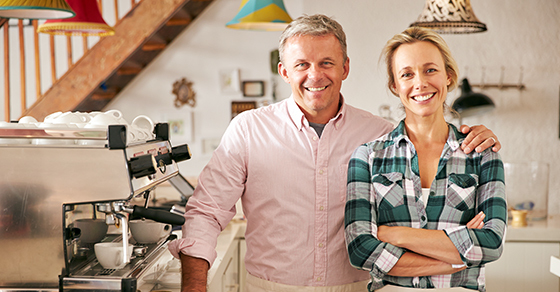 Fortunately, there are ways spouse-owned businesses can lower their combined SE tax hit. Here are two. The business hasn’t been represented as a partnership to third parties, such as banks and customers. If you can establish that your business is a sole proprietorship (or a single-member LLC treated as a sole proprietorship for tax purposes), only the spouse who is considered the proprietor owes SE tax. Let’s assume the same facts as in the previous example, except that your business is a sole proprietorship operated by one spouse. Now you have to calculate SE tax for only that spouse. For 2017, the SE tax bill is $23,023 [($127,200 × 15.3%) + ($122,800 × 2.9%)]. That’s much less than the combined SE tax bill from the first example ($38,250). Even if you do have a spouse-owned partnership, it’s not a given that it’s a 50/50 one. Your business might more properly be characterized as owned, say, 80% by one spouse and 20% by the other spouse, because one spouse does much more work than the other. Let’s assume the same facts as in the first example, except that your business is an 80/20 spouse-owned partnership. In this scenario, the 80% spouse has net SE income of $200,000, and the 20% spouse has net SE income of $50,000. For 2017, the SE tax bill for the 80% spouse is $21,573 [($127,200 × 15.3%) + ($72,800 × 2.9%)], and the SE tax bill for the 20% spouse is $7,650 ($50,000 × 15.3%). The combined total SE tax bill is only $29,223 ($21,573 + $7,650). More-complicated strategies are also available. Contact us at (818) 789 1179 to learn more about how you can reduce your spouse-owned business’s SE taxes.